Wanna know what torture is? Having to go to work on the day you are expecting a super fun package! Seriously, who needs waterboarding? Just send those terrorists a fun package then send them to work the day they're expecting it. This week is kickin' off into high gear this weekend! Bonfire at our place tonight, nature day at the in-law's hunting land tomorrow, photoshoots galore on Sunday...then back to the daily grind! Rules for 5QF: The first rule is the most important. If you do not follow it, I will be forced to beat you with a soggy noodle. Consider yourself warned. Okay...Rule Number 1: HAVE FUN!! Rule #2: (actually, the "directions" to participate!) 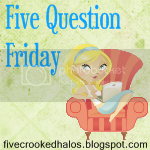 copy and paste the following questions to your blog post, answer them, then watch for the linky post to appear tomorrow morning! 1. Do you prefer your ice cream in a bowl or in a cone? 2. What three things do you love the smell of? 4. What sports did you play in high school if any and do you still play them? 5. Were you in band in high school? What instrument did you play? Wait. What kinda cone are we talkin' 'bout? If we're talking a chocolate dipped waffle cone, then yes...two please! But those boring, run of the mill cones? Meh. I'll take it in the bowl, then! Speaking of ice cream...does anyone else think that Cotton Candy ice cream is ridiculously delicious? Sounds like it'd be horribly sweet, right? Well, it's not. It's almost "mellow" in flavor but OH SO GOOD!! Try it. Then thank me. Oh, I love smells! Smells are one of the biggest "memory triggers" for me! I love the smell of Christmas...and Bath and Body has the most amazing Christmas scented candles. Hard to pinpoint what, exactly, I love about the smell of Christmas, but I do! Nutmeg. LOVE...but, kinda goes hand in hand with that Christmas smell! My husband's deodorant. Weird, I know...but I love sticking my nose in his arm pit and taking a big deep breath. Old Spice Red Zone. "Swagger" I believe. I give them, yes...but fairly reluctantly. I love the idea of giving a "gift". Something the recipient can actually open! There is something so fulfilling about finding that perfect gift that just lights a person up when you see them open it. So rewarding...and almost as good as receiving. Well, let me toss in a couple of key words..."tried to". I tried to play basketball. Couldn't make a basket to save my life. I tried to golf. Heard I had a good swing, couldn't hit the ball to save my life. I wished I played tennis, 'cuz those girls always had smashing legs. I had a blast playing intramural basketball. Kind of a "no-holds barred/UFC fighting" style of basketball. Totally fun. And, no. I don't play a single one, anymore. I do get involved in rambunctious game of kickball every now and again...but that's the extent of it. "This one time, at Band Camp..." Actually, I never went to band camp, but I was in band! Played the clarinet (wait, wait...key words again, "tried to") up until middle school and then switched to drums. Drums were incredibly fun. Only I couldn't really keep up with the snare drums very well, so I was always relegated to the cow bell or the cymbals. Fun times! Have you seen this video? The Ohio marching band? TOTALLY awesome. Kinda makes me wanna crash the marching band party and get in the action one more time, for old time's sake! Thanks for playing along again everyone! I love the smell of Old Spice too. Volleyball hurt the heck out of my arms too! They are sore just thinking about it. Glad that I'm not the only one sniffing around the Hubs' armpits! He uses the same thing! Yes... My second kiddo introduced me to cotton candy ice cream from Cold Stone. iPhone 4G vs. 4S...Help a sister out. CoverGirl Mascara...Don't Leave Home Without It!